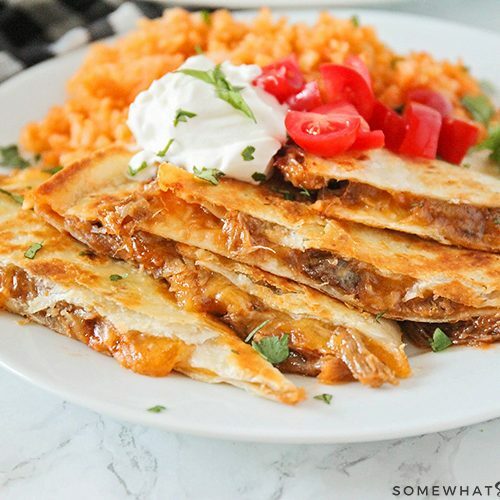 BBQ Pulled Pork Quesadillas are a quick and easy time-saving meal your whole Family is going to love! Quesadillas make a great appetizer or party food, but we also eat them for dinner during the week when our night is pure craziness! 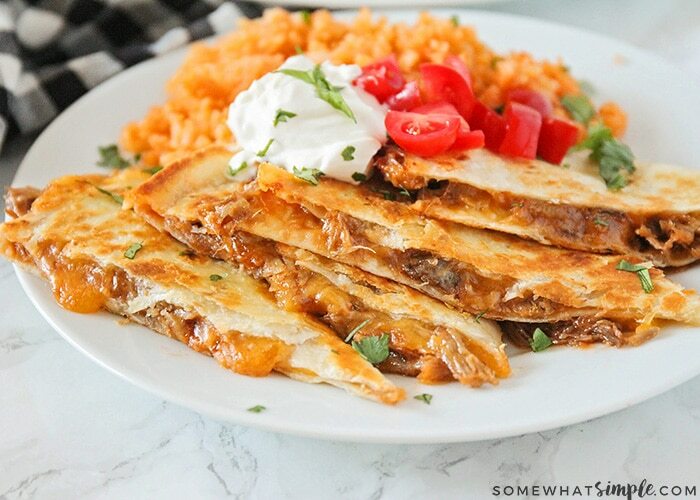 BBQ Pork Quesadillas are one of my new favorite Mexican dishes! 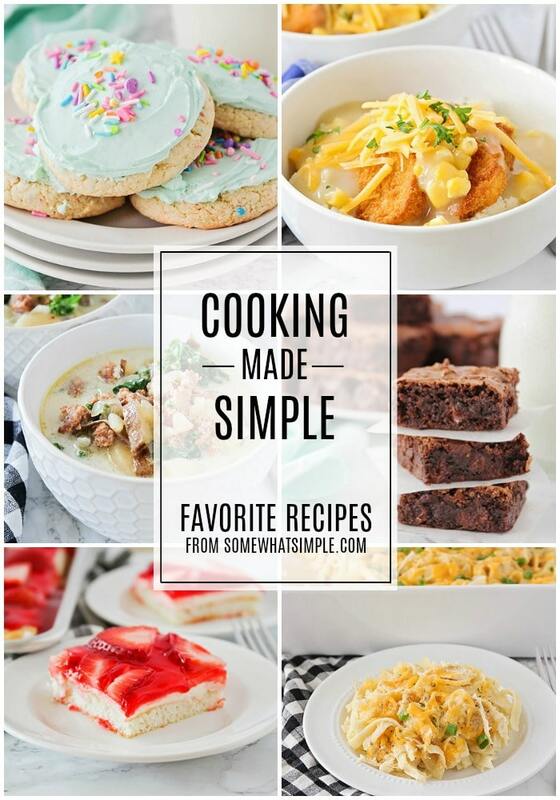 They have a sweet and savory kick to the classic tastes you’re use to, and they taste AMAZING! 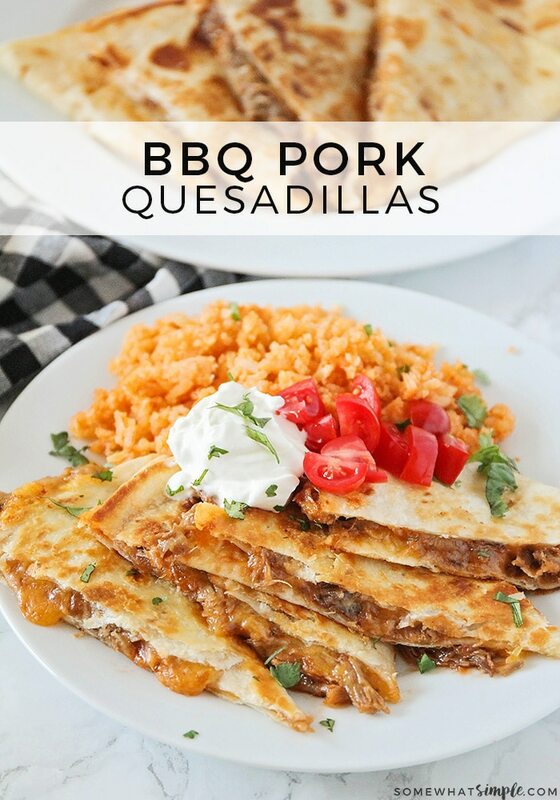 To make pulled pork quesadillas, you’ll need just a few ingredients – your favorite BBQ Pork (usually found in the refrigerated meat section, or sometimes by the lunch meats) + cheese + tortillas… and whatever quesadilla toppings you’d like to include! Start by heating up your pork in the microwave, according to package directions. Meanwhile, butter one side of each tortilla so that when you put it on the pan it gets nice and crispy! 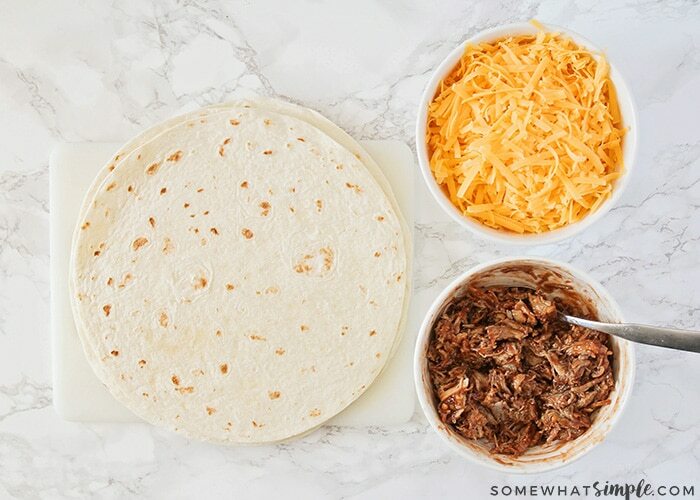 With the butter side down, add some warmed meat to a tortilla, then sprinkle with cheese. Top with another buttered tortilla, butter side facing up. 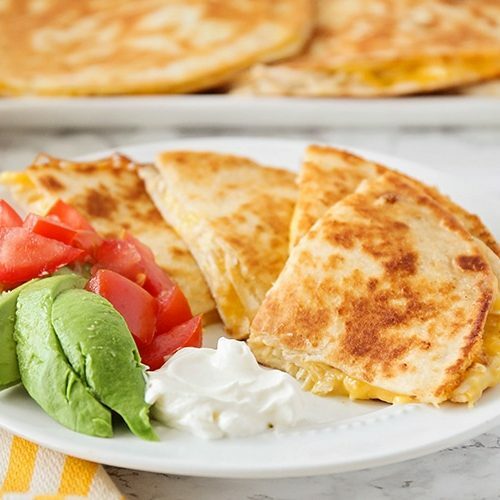 Put your quesadilla on a griddle or frying pan on medium-high heat for 2-3 minutes or until golden brown. Carefully flip to the other side and cook for another couple of minutes until the cheese is melted. Sprinkle with fresh cilantro, chopped tomatoes and any other favorite toppings and you’re good to go! Toppings: fresh cilantro sour cream, diced avocado or guacamole, salsa, sliced green onions, diced tomatoes, olives etc. Preheat your electric skillet or frying pan over the stove. Microwave your BBQ Pork according to package directions. Spread butter on one side of each tortilla. Place a tortilla on the skillet and top with a layer of pot and then a layer of cheese. Cook 2 to 3 minutes on each side or until the tortillas are golden brown and the cheese is nice and melted. Cut into triangular wedges and serve with desired toppings. 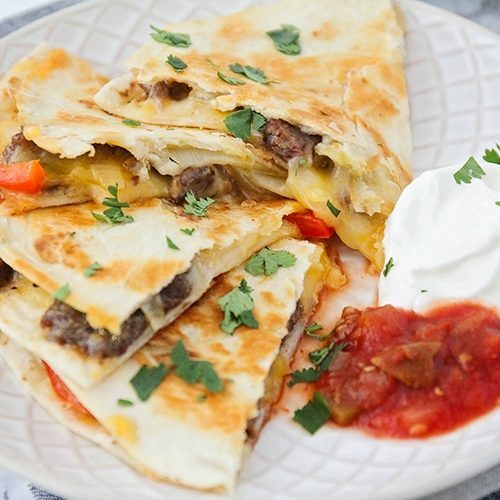 More quesadilla recipes you will LOVE! 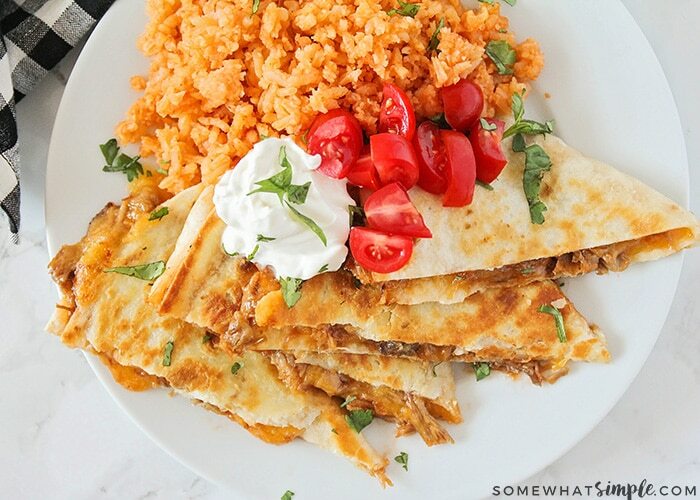 This quesadilla looks SOOOO good. And BTW, that Kraft cheese is my favorite. I buy the Mexican Four Cheese Blend and make my kids “cheesy quesadillas” all the time. A couple weeks ago I went to buy some cheese, and was wondering what happened to the stuff I normally buy, Then I noticed the new packaging. It’s great because it takes up less room in the fridge. 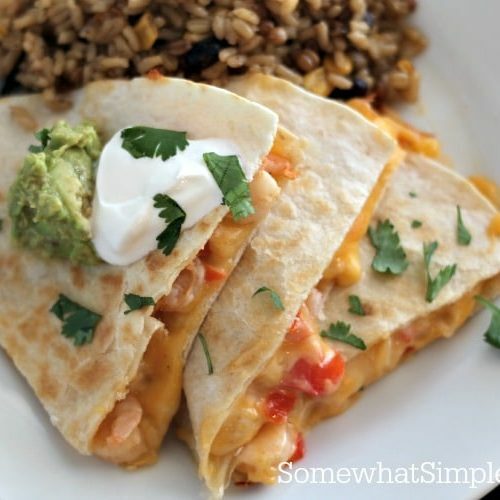 Next time I make my kids their plain quesadillas I will try these delicious ones for me…yum. Thanks Haley! I hope you like them!